The Hill Motel is snowmobile friendly, with parking allowed right up to your door and outside electrical outlets to plug in your vehicles! 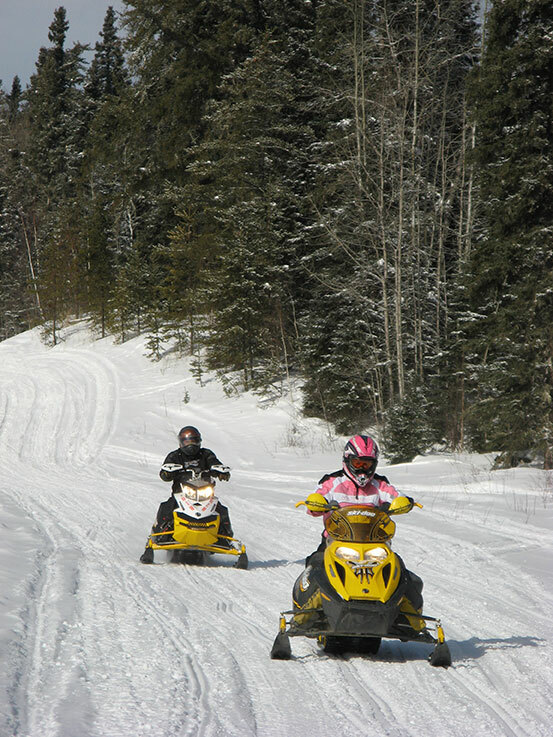 We have some of the best groomed snowmobile trails in Northern Minnesota! If you’re into snowmobiling then you’ve found a great place to stay! Minnesota’s interconnected snowmobile trail system is unmatched in scenic beauty as it crosses lakes, scenic woodlands and forzen wetlands, with great pit stops along the routes. There’s direct access to the Avenue of Pines trail system right in the motel’s parking lot. Area snowmobile clubs take great pride in ensuring their trail systems are extremely well marked and immaculately groomed. You can ride hundreds of miles to the north, south, east and west directly from our motel. We have the central location and comfortable lodging to keep you coming back year after year. Plan your Minnesota snowmobiling vacation for The Hill Motel in Squaw Lake, MN. Call us today for reservations: 218-659-9220.